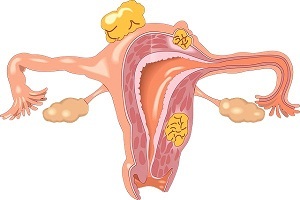 Welcome to DiseaseFix Section for Uterine Cancer (Womb Cancer) | Symptoms Causes. Uterine or womb cancer is one of the most common cancers of the female reproductive system. It is a malignant tumor that occurs in the cells of the uterus and also can spread or metastasize to other parts of the body. There are two primary types of uterine cancers which develop in different parts of the uterus – Uterine Sarcoma and Endometrial Cancer. Uterine sarcoma occurs due to abnormal growth of cells in the body of the uterus, usually in the muscle layer. Although the exact cause of uterine sarcoma is unknown but there are several risk factors though to cause it. In Stage IV, cancer has spread to various other parts of the body. Stage 0 is also known as carcinoma in-situ and is characterized by localized growth. Read about stages of womb cancer (uterine cancer).